If you want to think you’re getting a wall, just think it and sign the bill. She hasn’t lost a step, has she? As near as I can tell, Democrats didn’t lose much of anything in this bill. There’s a token amount for rebuilding some border fencing, but that’s all. The defunding of sanctuary cities got dropped. Domestic programs were fully funded. Opioids got more money. The Gateway Tunnel that Trump opposed as revenge against Chuck Schumer will probably get half a billion dollars, but it’s not actually mentioned in the bill so Trump can pretend it doesn’t exist. There are no restrictions on Planned Parenthood funding. UPDATE: Apologies. There are several different ways of totting up defense spending, but some are more defensible than others. The one I used initially wasn’t right, so I’ve redrawn the chart with better numbers. 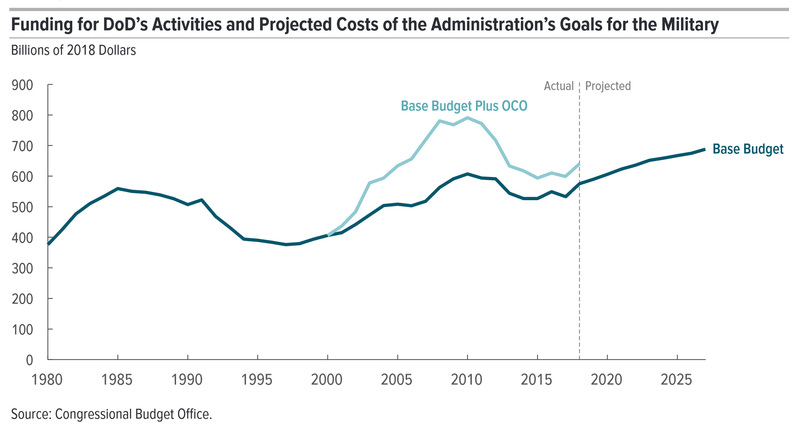 It now includes (a) base spending, (b) overseas contingency spending, (c) directly defense-related spending in other departments (for example, nuclear weapons development in the Department of Energy), and (d) spending on veterans. The Bureau of Economic Analysis provides this as “National Defense Consumption Expenditures and Gross Investment.” That is, operational spending + spending on capital goods (like jets and aircraft carriers).